Former President George H.W. Bush fractured a bone in his neck when he took a tumble at his oceanside summer home, but he suffered no neurological impairment and the injury will be allowed to heal on its own, which is expected to take three to four months, officials said Thursday. Bush, at 91 the oldest living former president, remained hospitalized in fair condition a day after he fell at his home in Kennebunkport. The fracture to his C2 vertebrae -- the second one below the skull -- didn't impinge on his spine and didn't lead to any neurological deficits, spokesman Jim McGrath said. The 41st president never lost consciousness and was being fitted with a brace to immobilize his neck, McGrath said. Dr. William D'Angelo, a neurosurgeon who is treating Bush at Maine Medical Center, said the former president was lucky the fracture wasn't more serious. 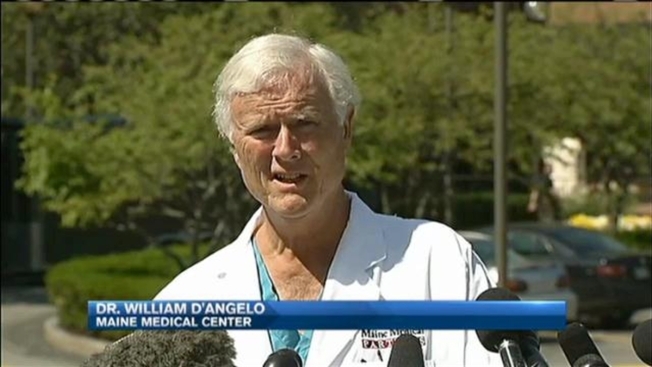 "He's in great spirits," D'Angelo told reporters outside the hospital. "He's with family. As his wife said, it takes a lot more than this to knock his spirts down. He was shot down over the Pacific in World War II. She said this is a small bump in the road." Bush is being treated at the state's largest medical facility, where a children's hospital is named for his wife. The family declined to say how he fell. A hospital spokesman said it was premature to speculate about when Bush will be released, but McGrath suggested it won't be a lengthy stay. "We do not discuss timelines for discharge, but do not believe this will be a prolonged recovery period at MMC," he said. D'Angelo said the injury is common among seniors who fall and can be painful. "It's a significant injury, but right now the president is in excellent shape, and we anticipate he'll make a full recovery," the doctor said. "He's tough. He can take it," D'Angelo said. "He's doing great, his spirits are good, and he's up and talking, and out of bed." President Barack Obama called Bush on Thursday morning to wish him a speedy recovery, a White House spokesman said. Obama made the call from Oklahoma, where he spent the night ahead of a visit to a federal prison there. Bush, who has a form of Parkinson's disease and uses a motorized scooter or a wheelchair for mobility, has suffered other recent health setbacks. He was hospitalized in Houston in December for about a week for shortness of breath. He spent Christmas 2012 in intensive care at the same Houston hospital for a bronchitis-related cough and other issues. The Republican served two terms as Ronald Reagan's vice president before being elected president in 1988. He lost to Democrat Bill Clinton amid voters' concerns about the economy after one term, highlighted by the success of the 1991 Gulf War in Kuwait. Bush was a naval aviator in World War II and his torpedo plane was shot down over the Pacific. He also served as ambassador to China and CIA director. The family patriarch celebrated his 90th birthday by making a tandem parachute jump near his Kennebunkport home. He celebrated a low-key 91st birthday with his family there. During the winter, Bush and his wife, Barbara Bush, live in Houston.